Speaking of my childhood, I recently found out that the little grocery store San Marcos up the street from where I work sells these little packets of "chocolate" and "hazelnut" candy - a box of 18 for $1.99. I did give in and buy one - they are still pretty good. 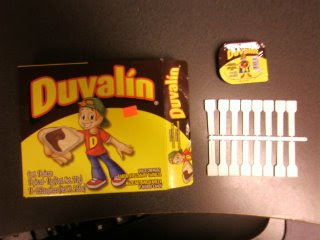 The white things are little plastic sticks that you use to move the candy from the packet to your mouth. you were confusing me - being over there and being me at the same time!